Please click on the title to view the menu. Chrome is the recommended browser. Please remember to retain a copy for your records. We are pleased to share this one minute commercial which was developed with assistance and support from The Foundation for Catholic Education&apos;s Marketing and Enrollment Committee. The video highlights the vibrant Catholic culture and rigorous academic programs offered at each of Chester County&apos;s elementary schools. Can you spot our fabulous Art Teacher, Mrs. Abell, and her students hard at work? Please encourage your friends and family to check out the benefits of a Catholic elementary school education...like we have at Holy Family School! HFS Drama Club Presents: Willy Wonka Jr. Please click the link in the title to order this year&apos;s yearbook Each yearbook is $20. We are ONLY taking orders online. All orders must be in by Sunday, April 21 (Easter). There is no service fee for using your credit card. Do not order yearbooks for the eighth grade students. Theirs is included in the graduation fee. Check out all that is happening at HFS in this week&apos;s PNN! This menu is best rendered in Google Chrome. If you pay online, please print a copy for your records. Holy Family School will be operating on a 2 hr. delay for Monday 3/4/19. Phoenixville will reevaluate conditions and make a final call by 7 AM. Please be safe. HFS will be on a 2 hour delay for Friday 3/1/19. Please stay safe! HFS is on a 1 Hr. Delay for Thursday 2/21. Please travel safely. Due to the forecast of inclement weather, Holy Family School will be closed tomorrow, Wednesday, February 20, 2019. Please stay safe and warm. Due to inclement weather, HFS is closed today. Be warm and stay safe. Click on the title to check out our announcement by the 5th grade! Holy Family School will be on a 2 hour delay for Tuesday 2/12. Phoenixville will reevaluate conditions and make a final call by 7 AM. Please be safe. 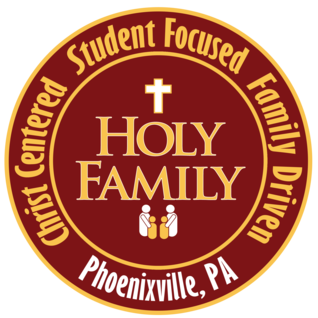 Holy Family School will be operating on a 2 hour delay for Monday February 11th. Please travel safely. Check Out All of the Catholic Schools&apos; Week Happenings on PNN! See all of our Catholic Schools Week Happenings on PNN! The March Lunch Menu is now available. Please remember to keep a copy for your records. This is best viewed in Google Chrome. The menu link has been fixed! The school will open at 9 AM and CARES will open at 8 AM. Stay warm and safe!